If you’ve been breaking out the Gopro for all those pow days this year then be sure to submit an edit in this year’s Shreddit Showdown. You still have a week left to put the finishing touches on your edit and if you’ve been procrastinating take a look below at all the prizes up for grabs. Get editing! It’s time for the 3rd annual Shreddit Showdown presented by Granite Chief. Don’t know what that is? Well, for the past two years Granite Chief has hosted an annual ski-movie edit contest for skiers from all over the country. These days, everyone has a GoPro or something similar, and this is the perfect opportunity to highlight all the amazing talent in our local ski communities. Participants can enter all types of videos. In the past we’ve seen ski videos ranging from spring park laps to big-mountain, backcountry ski videos. There have been videos that highlighted a single trip taken by friends, and just about everything in between. This year, given the great ski season that’s been happening all over the country, we’re really expecting to see some great entries coming in. In the spirit of doing things bigger and better, we’re hosting the 3rd annual Shreddit Showdown at the Tahoe Art Haus & Cinema in Tahoe City. Not only will contestants be competing for great prizes, we’ll get to those in a moment, but this year people will have a chance to see themselves skiing on the big screen. 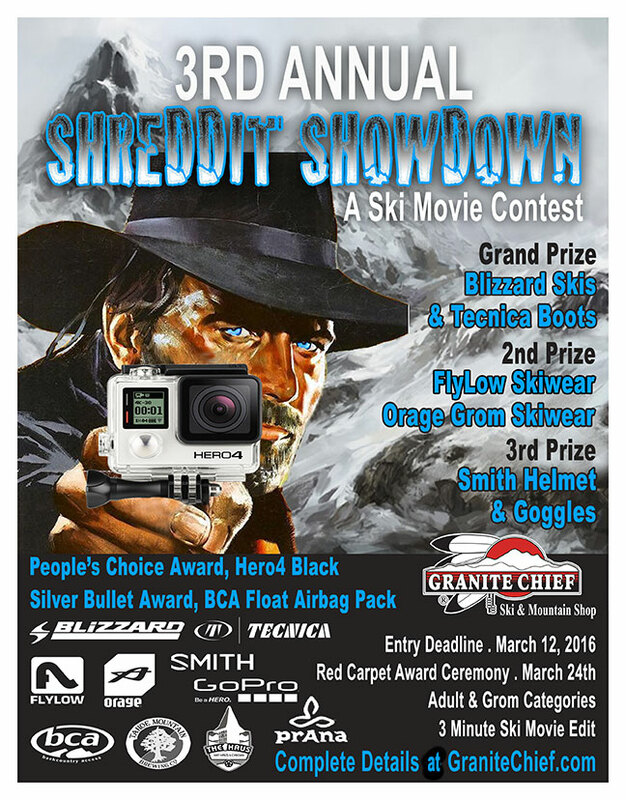 On Thursday evening, March 24th Granite Chief will host the Shreddit Showdown red carpet awards ceremony and video premiere at the Art Haus. We will be serving complimentary appetizers and champagne, in addition to all the tasty food and beverage offerings available for purchase. There will also be great raffle prizes and gear giveaways happening all evening. A big feature of the premiere this year is a red-carpet costume contest to see who will be crowned the “Best Worst-Dressed” skier in Tahoe. There will be both a men’s and women’s winner, and each will receive a $250 gift certificate from Prana. It’s not every day you can get paid good money just for wearing your old ski onesie or polyester tuxedo! The prizes for the Shreddit Showdown this year have been upgraded as well. We have over $7,000 in prizes, in both grom and adult categories. Prizes include skis from Blizzard, ski boots from Tecnica, outerwear from FlyLow and Orage, GoPro Black cameras, Smith helmets and goggles and, new for this year, an avalanche airbag from BCA that will be awarded to the winner of the prestigious Silver Bullet Award. The Silver Bullet Award rewards the skier who skis the single best line, trick, or perhaps crash of the entire contest. To enter click on the link and be sure to check out the event trailer and The Daily Pow’s second place entry from last year.